I was on a business trip the last few days and it is always great to get back home. The feeling is especially touching to my heart when Soeren and Tom pick me up and Soeren runs into my arms saying how much he missed me! Coming home is really great. This is the second edition of a new series I hope to continue on a regular basis. I have called it "Cooking School". What I would like to achieve with these series is to take a well known recipe for a dish that might be or sound complicated and try to simplify it down. By no means allowing it to suffer in taste, style or fragrance. Once I have completed my own experiments I thought I would share it with you so that you in future do not have to be intimidated by the recipe. Hopefully you will feel encouraged enough to give it a try yourself. Maybe you have an idea to refine it further and then share it with us here. That is the basic idea. Like the recipe for the Gnocchi I hope to bring you well known recipes that everyone enjoys - but mostly in restaurants or reading about them and never actually tried at home. I also hope to encourage those (especially my Indian buddies) to try something different. I have had a lot of mails (especially from my Indian buddies) telling me that they appreciate me sharing different types of herbs, produce and ingredients that they either would not use in that constellation or just did not know how to use at all. Another thing I hope you also noticed is that in my last few posts I have taken a specific ingredient contained in that dish and researched it a bit. Sharing what I researched with you, I hope you bring you more information on the health benefits, tips on how to store and shop and other helpful tricks. If you have further information, please do add this into the comments field. This way maybe we can build up on our knowledge for different types of food and ingredients. I would love your feedback on these ideas. For today I have a special treat for you. Panna Cotta - the mother of all sins! A smooth, milky Italian dessert that sometimes falls short. Probably because it is so sinful! Anyone watching their waistline should look away at this point. When the lovely Lisa of La Mia Cucina and the fabulous Ivonne of Cream Puffs in Venice invited me to join their festivities at La Festa al Fresco I was thrilled. My mission was to bring along an Italian dish to fill their empty table. DING! They hit home with that theme here. Yes, I am Indian who has been brought up in various parts of the world and spent the last 13 years in Germany - so where does THAT hit home, you ask? Well you know already! I am an Italian fan through and through and as I have repeatedly said it here - I love everything Italian. Our food habits at the Wolff's den are also very Italianized rather than Indianized! So, I was excited to say the least. What is Panna Cotta? Literally translated it means "cooked cream", which pretty much gives away the main ingredient in this dish. It originates from the Piedmont region in Northern Italy, where the dairy products available are regarded as the best in the world. It is important that you use a good quality of cream, without additives for this. Perfect would be an organic brand. In restaurants it is often served with complicated sauces. 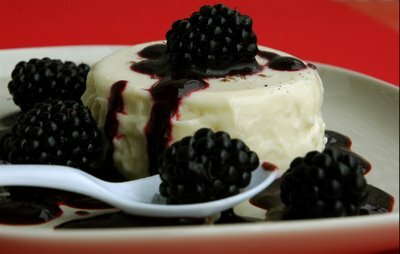 I like using berries for a simple sauce to dress my panna cotta. For this particular recipe I used blackberries. These have been available at our Farmer's Market in abundance and are sweet, succulent and totally lovely. There is also a healthy side effect too. 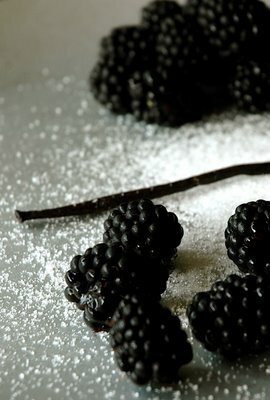 Blackberries rank, amongst other fruit, highest in their content of antioxidant phytonutrients. Photo on Explore: August 31, 2006. View my entire Explore Photostream. In a bowl filled with cold water, soak the gelatin sheets for at least 5 minutes. Cut the vanilla pod lengthwise and scrape the contents with the back of a knife. In a pot add the cream, 50 g sugar, vanilla pod and the vanilla pulp and simmer for 15 minutes over a low heat. Remove the pot from the heat. Take out the vanilla pod. Squeeze out all access liquid from the gelatin and add this to the hot, but not boiling cream. Mix to dissolve. Run four ramequin bowls (approx. with 1/8 l contents) under some cold water, then fill with the vanilla cream mixture to the rim. Allow to cool in the fridge for at least 6 hours. Keeping it overnight in the fridge is recommended. Using 150 g of the blackberries, place them in a bowl and puree them using a puree mixer. After this add to a sieve and strain the sauce, leaving the harder bits in the sieve to give a smooth silky sauce. Add 2 teaspoons of sugar and dissolve in the berry mixture. Take the Panna cotta out of the fridge. With a knife run along the edge of the bowl and carefully release from the edges. Fill a container with hot water and place the Panna cotta bowls in the hot water for just a few seconds. Place a plate on the bowl and turn upside down. Remove the bowl and what you should have on the plate is a lovely, creamy Panna cotta form. Add some blackberry puree around and over the Panna cotta and decorate with other whole berries. Spoon after spoonful, this dessert sends you to heaven 17! Although it is white and looks so very innocent, this dessert is full of delicious calories. But you know what it is worth every sinful bite! 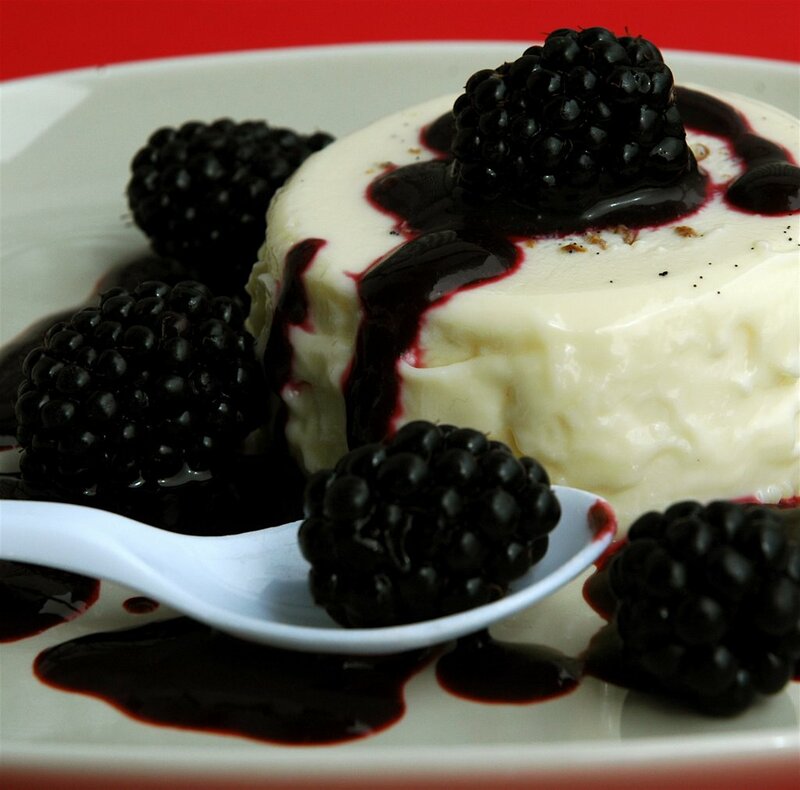 The creamy texture of the Panna cotta with its vanilla flavors combined with the sweetness of the blackberries is truly tantalizing to the very last spoonful. I made four and Soeren ate two! He just could not stop scooping the sauce onto the Panna cotta and then licking the spoon from top to bottom. Tom to found this combination with the blackberries exquisite and that is saying something for someone who is not too keen of full cream desserts. This is also a perfect entry for the JFI event, being hosted at Vineela's. The theme this month is Milk and Milk Products. Check out my featured blogs for Blog Day today. What sinfully delicious dish indeed, Meeta! I love your cooking class idea and I think it's a wonderful series. Your gnocchi were certainly delicious and I look forward to what you come up with next! And now the panna cotta ... next to creme brulee, panna cotta is one of my ultimate favourites! Yours looks so creamy and blackberries are the perfect additions, especially at this time of year. Thank you so much, Meeta for bringing this dish to La Festa al Fresco. It shall have a place of honour at our table! Thanks for sharing and participating in JFI. i am looking for this recipe for so many now iam having script in my had? May be i may try to do with agar agar instead of gelatin. See you in round up. Now you've done it.. you've got me *swooning* and drooling all over my keyboard! The vanilla and the blackberries.. ohhhhh! The creaminess of the panna cotta.. ohhhh! oohhhh!! Thank you soooooo much for bringing this sinfully delicious and beautiful dessert to the party! I, too, also love the idea of the cooking school.. I've never made panna cotta before and now I know that I can follow your directions and make it for my family! Yay! Can I be first in line? I've never had panna cotta. I think I need a trip to Italy!! That looks fabulous Meeta, especially the panna cotta white with the blackberries!!! It looks delicious, and makes my mouth water, and that for someone who does not like creamy deserts. I like your idea of the cooking school. And yes, if I have a recipe that is too complicated, will send it to you and try out your version ;-). I am Italian and love panna cotta... I read very carfully your recipe and I can say that it is perfect, exactly as it should be made. I like it with fresh fruit. Mmmmhhh, this Panna Cotta looks really appetizing! Looks delicious. I just saw Archana's version and yours looks equally great ! Thank you so much for sharing this. Wow! wonderful looking dessert Meeta...this time u seem to have twinned with Archana....your snaps are always awesome.. I've been thinking about doing a panna cotta for a while, now I am convinced, I have to try it! Wow what a wonderful dish this is !!! I really admire your way you write up and give such a fantastic dish every time. The music with the dish is a very special touch !!!! Great work !! Meeta - you MUST have been Italian in a former life. This was a great post! I'm assuming that those blackberries are local? They look delicious as does the entire dish!! I have never made panna cotta so this will be fun! So, are you planning to move to CA any time soon? AWWW! You guys are all sweetaholics! Ivonne You make me blush. I am glad you invited me, THAT was an honor. Vineela Glad you liked it Vineela. I hope you let me know what you think of it when you've made it. Your verdict would be appreciated! Lis, baby, then I succeeded! I wanted to do this especially for you to show you my appreciation for sharing your friendship. Tanna for you I'd make an extra batch any day. If you do travel to Italy I'd love to join you. I love the country and need the smallest of excuses to go! Thank you. Isis Thank you and I am glad you're back! Orchidea Ciao! Your comment meant a lot, thank you! Rosa Thank you for your comment on the recipe and the pictures. Always appreciated! Krithika"Great minds think alike!" Glad you liked both versions! DianneLet me know how it worked for you. RevathiThank you so much. Your motivation keeps me going on! You are brilliant! meeta your wonderful post of Panna Cotta clinches it - I must make this beautiful dessert. I was just on vacation with my sister mooncrazy over at PBE and we happened to have a Meyer Lemon Panna Cotta for a lunch dessert. While looking for a recipe I found yours - thank you so much for sharing. Well, that brings a very vital doubt. Do I use 'Schlag Sahne' or 'Rahm'? While I always see the former in both the normal supermarkets and bio shop, I never find the latter (which the dictionary tells me is Cream). Please help! I should try with Agar-agar...(I never knew gelatin is derived from pig until few hours ago... i used to love jujubes back home but now a strict 'No'). I used Shlagshane from Demeter. It tured out really well. Do let me know how yours turn out. I did it! Such a simple dessert (with some patience) and lovely. I added a packet (10g) of agar-agar for 500ml cream (as told in the packet... i suppose all brands do not mean the same) and simmered it along with other ingredients. Latha Oh I am so pleased that you had a go at this and you liked it. Your creativity is brilliant and you see that it can be made in a variety of different flavors. Well done. Ohhhh I am really happy someone had a go at this! !